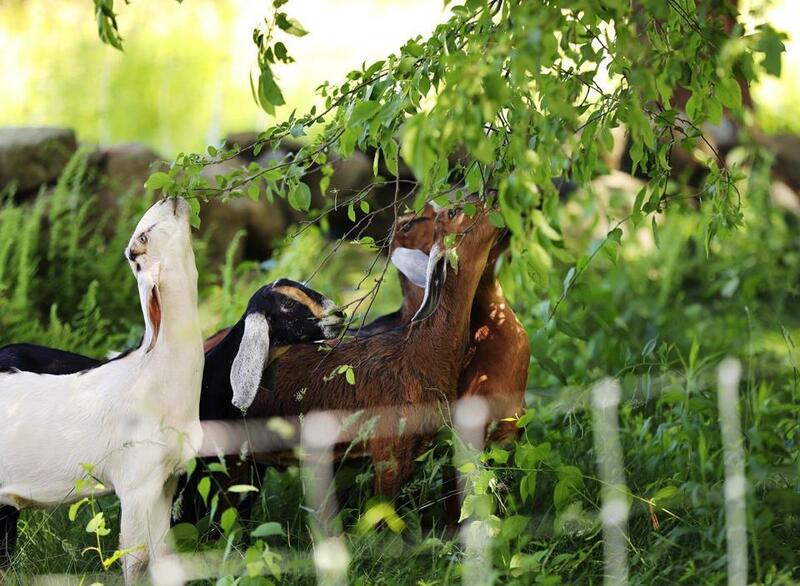 Inside their portable fence, the herd chomps down invasive weeds in Concord. Like generations of teens before him, 17-year-old Kyle Bonenfant of Carlisle earns money in the summer by tending to neighbors’ lawns. But Bonenfant’s mowing equipment doesn’t come with tires, pull-cords, or gas tanks. Instead, his fleet of mowers comprises hooves, tails, ears and, most importantly, hungry mouths. Bonenfant’s business, Fraser Farm Goatscaping, deploys goats and sometimes sheep to clean up yards. When customers want shorter grass or an environmentally friendly solution to the problem of poison ivy, buckthorn, Japanese knotweed, or other invasive plants, Bonenfant sets up movable fencing at the job site and lets his animals loose — from a few hours to a couple of weeks, depending on the size of the property. Bonenfant’s earliest forays into the agricultural arena came when he was in elementary school. 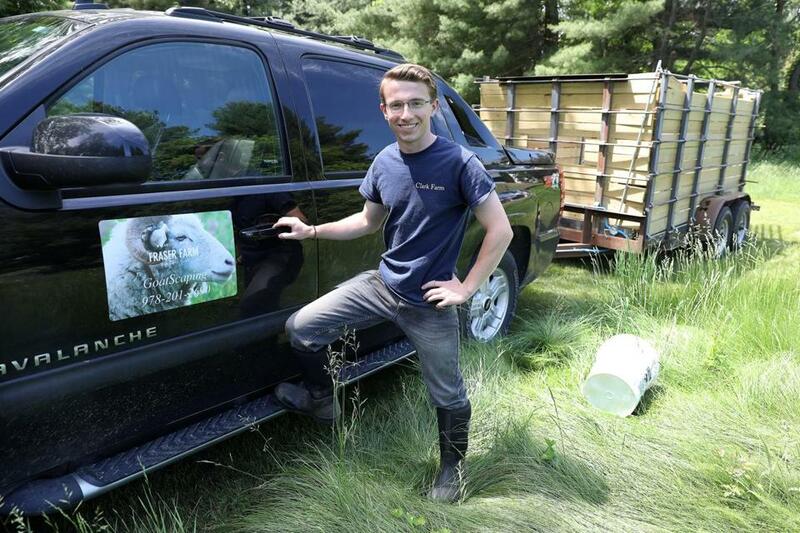 Kyle Bonenfant with his truck and the homemade trailer he built to deliver his goats. Bonenfant uses a bucket of grain to lure the goats to the job site. At the age of 11, Bonenfant learned about the nascent Young Farmers Program at Clark Farm, an organic farming business in Carlisle that includes a CSA and produce stand. He started out with a weekly stint of weeding. Each summer, his responsibilities at Clark Farm grew. Clark Farm manager Andrew Rodgers noticed even then that Bonenfant was “an incredibly hard worker, very efficient, and able to follow directions.” He expanded Bonenfant’s responsibilities to include overseeing teams of younger crew members. When another local farmer relocated to California last fall, Bonenfant bought that farmer’s flock of a half-dozen sheep and consulted with Rodgers about ways that he could turn this into a business of his own. Rodgers, who said that at age 17 Bonenfant “is very entrepreneurial and has a phenomenal work ethic,” helped him to develop a business plan based on the idea of bringing sheep to various properties to mow the grass. 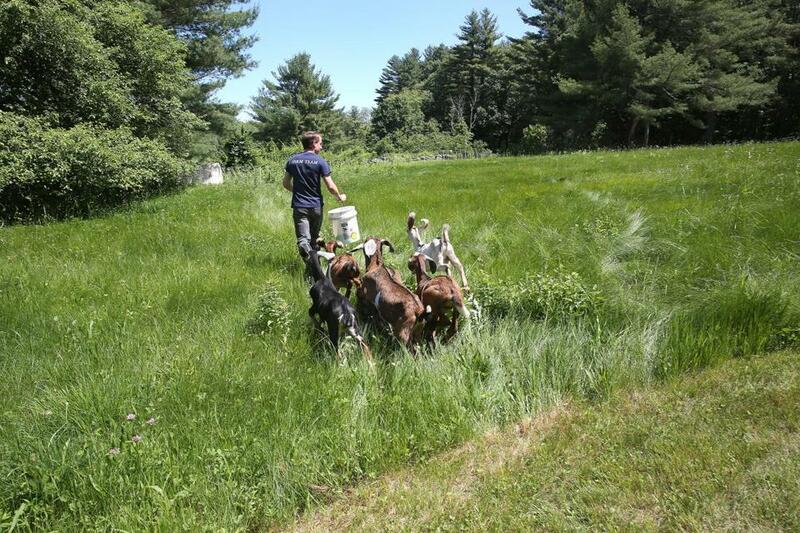 Envisioning that goats might do the job even better, Bonenfant purchased a small herd of wethers — male goats not used for breeding — from a dairy farm in Topsfield. “I took them home last spring when they were two weeks old,” Bonenfant recounted. With help from his father, Brian, a professional builder, Bonenfant made a 10- by 10-foot pen with pallets, hay bales, and wood shavings for the young goats. By June, his herd was ready for active duty. Bonenfant constructed a livestock trailer he could pull with his truck, designed a website, and started publicizing his services. Mollie McPhee of Carlisle had considered hiring a landscaper to cut back the blackberry brambles overtaking her back yard, but once she learned about Bonenfant’s business, she immediately contacted him. The mowing aspect of the business is appealing, and the reduction of poison ivy and other invasive species is particularly helpful, Bonenfant concedes, but many of his clients simply like the holistic approach and the educational aspects of his endeavor. Frequently, parents commission Bonenfant and his goats to give their young children a taste of farming life. 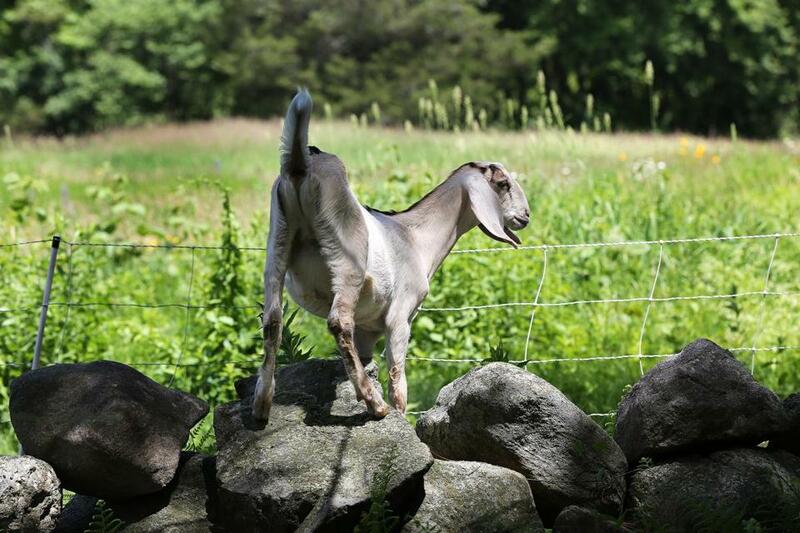 Bonenfant, whose fee starts at $75 per day, hopes that goatscaping is only the beginning of his agricultural career. A rising senior at Concord-Carlisle High School, he’s investigating colleges with agricultural programs so that he can learn the business side of farming to supplement what he already knows about day-to-day operations. Learn more about goatscaping at www.fraserfarmcarlisle.com. For Crystal, a member of the herd, the grass is always greener on the other side.